This Post relates to changing the fluid on a GEN3 (2009) XC70. The Gearbox is a 6-Speed Automatic (TF-80SC). The Gearbox is supposed to be sealed for life, but many owners report changing the fluid and finding a dark sludgy liquid in there after only 50,000 miles (see Pete's thread). My own car is on 58,000 miles, and the fluid was in reasonably good shape, still reddish, and looked OK (but I don't use my car for towing, I always select neutral when stationary, most of my journeys are quite long, and rarely stop-start driving). The Auto Box holds 7.0 litres of Transmission fluid JWS 3309 (according to my manual). 1. The one "drain and fill" described here, where approx 3 litres of fluid is changed at a time. 2. The "gibbons method" of flushing where a drain and fill are included in the circuit, and the car's pump moves the oil around, drawing in fresh oil, and dumping old oil. On the Volvo, you remove the line to the transmission oil cooler, and put that to waste, and have another pipe to a container of new oil into the oil cooler, when the car is started the old oil is pumped to waste, and the new oil is drawn into the system. 4 litres of JWS 3309 Fluid (I managed to only use 3, but see below). I went for a short drive first to warm things up. My drive is on a slight slope, so when I run the front of the car up on some bricks, the car is level, and it gives me slightly more access underneath. First I removed the sump cover (large plastic cover underneath with 8 x TORX fasteners). Then the Air Filter box. It's mounted on 2 rubber holders. I removed the pipe at the front (inlet) first. Then loosened the jubilee clip where the airbox goes into the large pipe along the front of the engine (and sealed both ends with cling film to make sure I didn't drop enything in there). ^^^ Note the sump drain plug has a "pipe" to the top of it, which sets the level. Have a container (which will hold a minimum of 3 litres) under the drain/level plug now, and catch all the escaping oil so you can measure it later... I removed the level plug first (you have to do this anyway, to allow the 17mm tool to be inserted). When I removed my level plug, around a cupful of oil escaped (engine off, lukewarm, level ground). Now take out the 17mm plug, and catch the escaping oil. Measure the drained oil (mine was exactly 3 litres). Install the drain plug (I didn't use a new washer, but I will next time) and level plug (I didn't install the level plug, and a small amount of new oil escaped when the 2nd litre was filled, before I quickly re-insetred the level plug). Both the level screw and the filler plug have re-useable rubber washers. If you are happy to measure the new oil, and confident you have added the same amount as drained, you may wish to just refill the oil with the same amount as drained, and the level should be correct (see below for the info from VADIS on oil level checking). Using the funnel (as shown in the first image), I refilled exactly the same amount of oil as had drained (3 litres). Once refilled, re-install the filler plug, air filter box, sump guard, job done. Note! Leave the engine running during the entire check. Note! The following measure must be carried out quickly to avoid overheating the fluid. Run through all the positions between P and D on the gear selector. Stop at each position for at least 2 seconds. Perform this process twice. Allow the transmission fluid to heat up to 50 ºC. 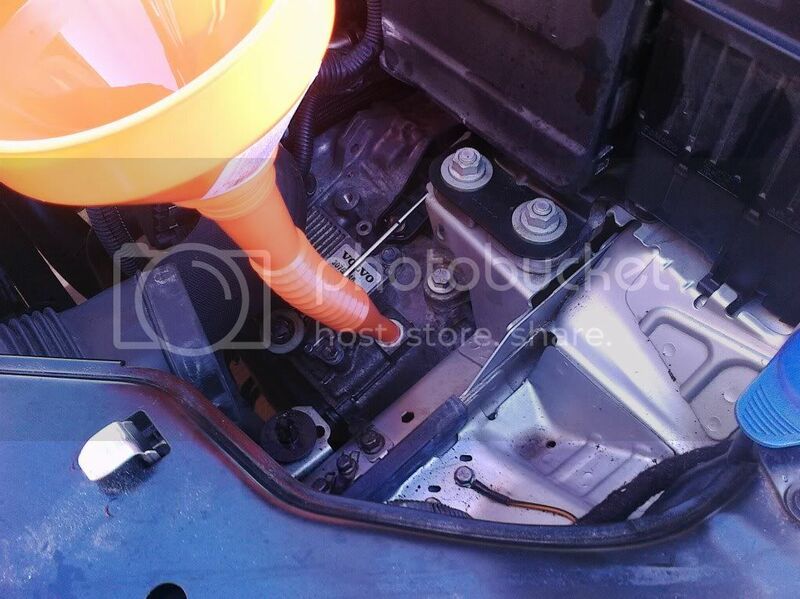 Place a lower drip shield on the floor under the vehicle. While the engine is running, remove the integrated level plug (Torx 40). Allow the excess fluid to run out. When the fluid is between 50 ºC and 60 ºC, check that the transmission fluid has stopped running out and is only dropping from the level plug hole. Caution! It is essential the temperature not exceed 60 ºC, as this can result in the transmission fluid level being too low. Fit the integrated level plug (Torx 40). I should expect that following this procedure, (obviously without a workshop diagnostic tool, we can't check oil temperature, but realistically, "lukewarm" should be fine) that around 200ml (i.e the amount I purposely overfilled by) of fluid will run out of the level plug, and the level will be set correctly. The car does drive better since the fluid was changed, the gearchange does seem smoother.